Here you can print piano keyboard diagram templates for free, and learn all the note names quickly and easily on the piano keys. As you start learning the piano, you can also use a Piano Keyboard & Note Chart like this, for placing behind the keys. Or simply put Keyboard Stickers with note names on the keys that you can easily remove later. Piano keyboards exist in many different sizes and with different numbers of keys. A full sized regular piano keyboard has 88 keys. Other electronic piano keyboards can have almost any number of keys. When buying a piano or keyboard it is good to remember that a lot of piano pieces are not playable on keyboards with fewer than 88 keys...! So, How Many Different Notes Are There? 7 are the Basic Notes, named after the first 7 letters in the alphabet; A, B, C, D, E, F, G. These are also the white keys. 5 are Altered Notes, a semitone / half step higher or lower from the basic notes. These are the black keys on a piano. On the piano keyboard this can be easily seen in the pattern of the white and black keys. 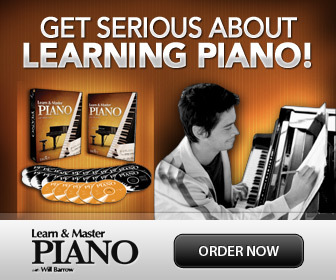 So, the piano keyboard actually has only 12 different keys; 7 white keys and 5 black keys. The rest of the keys are just repeated with either higher or lower pitch. You can see that the 7 basic notes (A B C D E F G) are repeated over and over. But each time the pitch (how high or low the tone is) is sounding one octave higher (if you go to the right). An octave is the distance, or interval, from one note or tone to the next with the same name, higher or lower. You can also see that all keys have a black key between them except between E - F and B - C.
All steps (the interval from one key to the next) that have a black key between them, are called whole steps. Those that don’t, E-F and B-C, are smaller and called semitones or half steps. There are also half steps between a black and the white key next to it, or reversed. And there are whole steps from one black key to the next with a white key between. See how the black keys are grouped in two’s and three’s, all over the keyboard? This repeated pattern also makes it easier to find our way on the piano. The black keys make it possible to play many more scales and melodies. They fill in the “gap” where there are whole steps, so to speak! By playing all the keys one by one, both the white and the black keys next to each other, you can play a chromatic scale. A chromatic scale is made from only half steps or semitones. The black keys are named after the white right next to them; they are alterations of the white keys. The black keys have two names. The name depends on from what white key it started from, the one above or the one below. So how do you alter a white key? Easy, just use one of two music symbols; the sharp (♯) or the flat (♭). These symbols, together with the natural sign (♮) are called accidentals (nope- no accident!). You will see accidentals written in the sheet music right before a note. By the way: If you just mention a black key without reading any sheet music, it is OK to use any of the two names. Let’s say you read the note C. If there is a sharp sign (♯) in front of C you get to play the black key a half step higher (to the right) - Yay! In the same way you can use the flat sign (♭) to lower a note. -Whoa, stop there! D♭ is the same key as C♯??? Yes it is! The keys can have two names, depending on the accidentals. If they end up on the same key like this, they are called enharmonic (“one sounded”). You can use a sharp or flat sign on any note. So even an E can have a sharp sign… and where does it go? To F! Since there is only a half step between E and F - and a sharp sign raises the note a half step - there is only F to go to. So E♯ and F are also enharmonic.